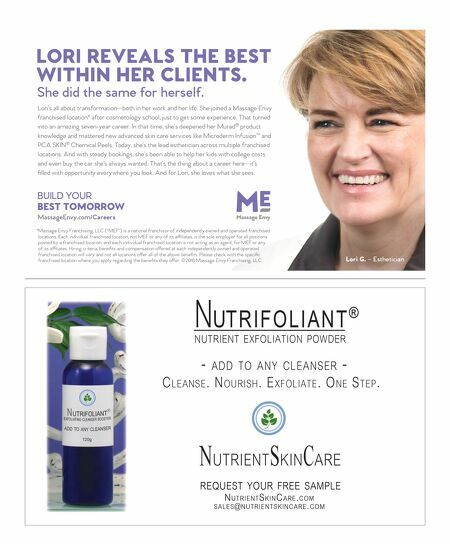 www.ascpskincare.com 47 expertadvice BUSINESS BASICS ink Big Apply big-business management practices to your small business by Kristin Coverly Just because you're a staff of one doesn't mean you can't run your small business like big businesses do. 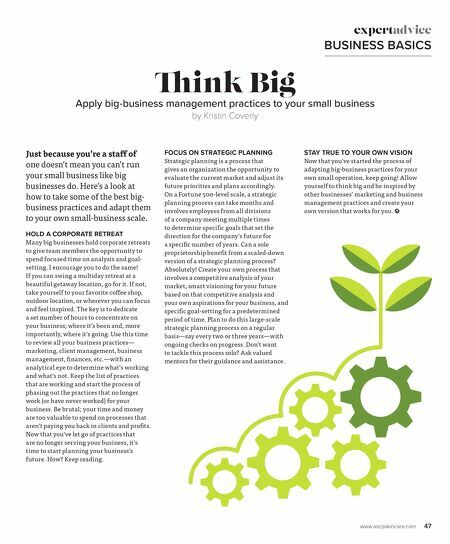 Here's a look at how to take some of the best big- business practices and adapt them to your own small-business scale. HOLD A CORPORATE RETREAT Many big businesses hold corporate retreats to give team members the opportunity to spend focused time on analysis and goal- setting. I encourage you to do the same! If you can swing a multiday retreat at a beautiful getaway location, go for it. If not, take yourself to your favorite coffee shop, outdoor location, or wherever you can focus and feel inspired. The key is to dedicate a set number of hours to concentrate on your business; where it's been and, more importantly, where it's going. Use this time to review all your business practices— marketing, client management, business management, finances, etc.—with an analytical eye to determine what's working and what's not. Keep the list of practices that are working and start the process of phasing out the practices that no longer work (or have never worked) for your business. Be brutal; your time and money are too valuable to spend on processes that aren't paying you back in clients and profits. Now that you've let go of practices that are no longer serving your business, it's time to start planning your business's future. How? Keep reading. FOCUS ON STRATEGIC PLANNING Strategic planning is a process that gives an organization the opportunity to evaluate the current market and adjust its future priorities and plans accordingly. On a Fortune 500-level scale, a strategic planning process can take months and involves employees from all divisions of a company meeting multiple times to determine specific goals that set the direction for the company's future for a specific number of years. Can a sole proprietorship benefit from a scaled-down version of a strategic planning process? Absolutely! Create your own process that involves a competitive analysis of your market, smart visioning for your future based on that competitive analysis and your own aspirations for your business, and specific goal-setting for a predetermined period of time. Plan to do this large-scale strategic planning process on a regular basis—say every two or three years—with ongoing checks on progress. Don't want to tackle this process solo? Ask valued mentors for their guidance and assistance. STAY TRUE TO YOUR OWN VISION Now that you've started the process of adapting big-business practices for your own small operation, keep going! Allow yourself to think big and be inspired by other businesses' marketing and business management practices and create your own version that works for you.